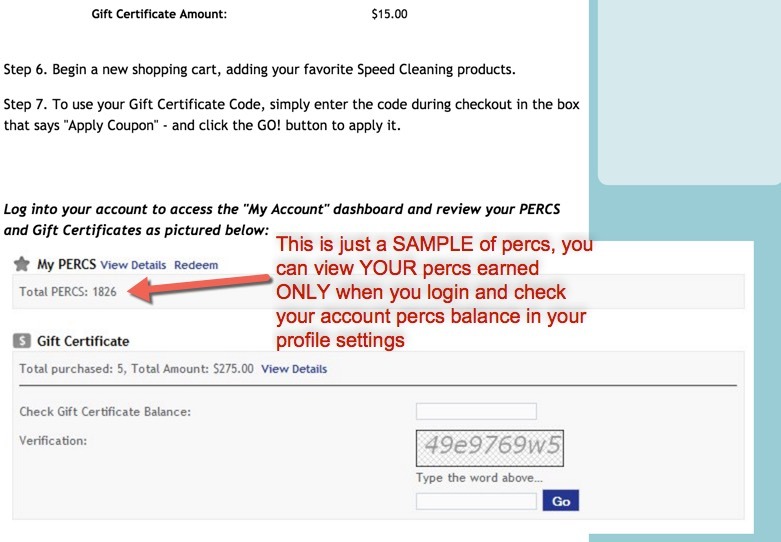 The PERCS you've earned prior to your first order on the NEW website are in the system. However, we must manually connect them to your new online account in order for you to use them online. Please contact us via phone (800-717-2532) or email if you would like to have your PERCS added to your new online account. We've changed how PERCS can be redeemed online in an effort to make it simpler for you to SAVE! Rather than each product having a value in PERCS, PERCS are now redeemable for Gift Certificates with a specific value that can be applied to ANY order (minus shipping). Each time you place an order online, PERCS are automatically added to your online account. You can check your balance by logging in to your account. Once PERCS accumulate, you can redeem them for Gift Certificates that can be applied to any order. Each gift certificate is automatically assigned a code that works exactly like a coupon code, but with a dollar value tied to it. Step 5. To get the code for your PERCS, you will receive 2 separate emails. 1. Is the "order confirmation email" 2. Is the "Clean Team Catalog Gift certificate" email. Step 6. Begin a new shopping cart, adding your favorite Speed Cleaning products. Step 7. To use your Gift Certificate Code, simply enter the code during checkout in the box that says "Apply Coupon" - and click the GO! button to apply it. SAMPLE PIC ONLY - Actual account value will depend upon your purchase history.